An MMA Podcast for fans by fans bringing you conversations with the biggest names in the sport of Mixed Martial Arts! From UFC, Bellator, Titan FC and everyone in between! Give it a click---an MMA Podcast for fans from fans! Welcome back fight fans. Looking for an extra show to catch before UFC 235? This week we talk with pro MMA fighter Serena DeJesus. Serena had an amazingly honest conversation about female fighters and the stress of making weight. We also talk about her friend Roxanne Modafferi and her upcoming fight. Catch Serena and Roxanne's fight to watch for tonight. After being pulled from UFC in Phoenix, Lauren Murphy comes on to discuss the card as she viewed it from the seats. A big supporter of the show, and regular guest, Murphy gave us an update on her health and when to expect her back in the octagon. After back-to-back defeats by TJ Dillashaw, Cody Garbrandt's boxing coach, Robert Meese joins the show. Meese talked with us about Garbrandt's return to the octagon against Pedro Munhoz and a camp Meese won't be part of. He also discussed time working with Lance Palmer and Bareknuckle boxing. In a few hours, Bellator 215 kicks off with a weekend at Mohegan Sun in Connecticut. Ahead of the fights, Blake Stephenson on Loaded Joes and Unfiltered Bachelor Podcasts joins me for a breakdown on some of the biggest fights this weekend. We also break down ESPN's first Sunday UFC card. Enjoy a full weekend of fights. Today we turn our sights on Bellator 215 with two fighters taking to the cage in newcomer Austin Vanderford and veteran Amanda Bell. The two talk about their upcoming bouts as well as give us, seemingly, different perspectives in their fight careers. With Steve Dunn sidelined for a bit, I had to reach out and bring back the originator of the SFLC Podcast, Mike Heck. Nothing has changed with us: you give us MMA topics and we discuss. Heck and I chatted about UFC Fight Night in Brazil as well as the first UFC Press Conference on ESPN and what to expect this weekend from UFC 234. We are back this week discussing some of the bigger stories from the weekend. Steve Dunn and I go back-and-forth on the Khabib Nurmagomedov fine and suspension, Jon Jones one fight license and Ryan Bader's quick work of Fedor. Ahead of UFC 234 in Melbourne, Australia, Austin "Golden Boy" Arnett joined the show to talk about his bout with "Sugar" Shane Young. Austin talked about his time with SikJitsu and how they plan on bringing a wallaby back from Australia following a victory. Just ahead of the first fight card on ESPN+ Steve Dunn and I break down this fantastic fight card while also discussing the future of MMA as we switch from traditional cable television to streaming services. 2019 will certainly be an interesting year for viewership. 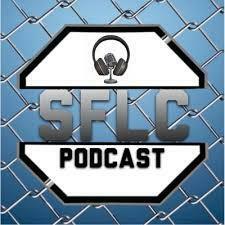 This week on the SFLC Podcast, long time friend of the show, Lou Giordano of Loutrition joins us to discuss some interesting changes made in the UFC for 2019. The biggest topic we discuss is the added option of Trifecta Meal Prep for fighters during camp and fight week. For an undisclosed nominal fee, fighters can use Trifecta for meal prep and weight loss for upcoming fights.